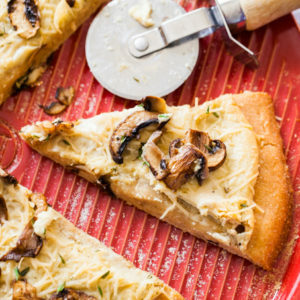 The ULTIMATE Wild Mushroom + Garlic White Pizza. Seared wild mushrooms with fresh thyme on homemade dough with a creamy garlic base and vegan parmesan. Dough- Combine the flour, salt, yeast, and sugar in the bowl of a stand mixer fitted with a dough hook. Set the speed to medium. While the mixer is running, stream in the warm water and 2 Tbsp olive oil. Beat until the dough forms into a sticky ball. If it's too sticky, add flour 1 Tbsp at a time. If it's too dry, add more warm water 1 Tbsp at a time. Transfer the dough to a floured cutting board and knead until it's a solid, smooth ball. Grease a medium bowl with 2 tsp olive oil. Place the dough in the bowl and cover. Let the dough rise for an hour in a warm place until it doubles in size. Transfer the dough back to the cutting board and cut it into two pieces. Cover both pieces with plastic wrap or a clean towel. Let sit for 10 more minutes. Use one piece per pizza. Dough may be stored in the fridge for up to 5 days, sealed very tightly. Garlic Cream Sauce- Boil the cashews for 10 minutes to soften or soak them in water for 2-3 hours, then drain. Place the softened cashews in a blender with the garlic, lemon juice, salt, pepper, and nutritional yeast. Blend until smooth, about 2-3 minutes. Mushrooms- Heat 1 tsp olive oil in a skillet on medium high. Sear the mushrooms and garlic for 3-4 minutes until they begin to darken. Pizza- Preheat the oven to 425 degrees. Grease a baking sheet or pizza stone with a small amount of olive oil and flour. Roll out the dough into a large circle then carefully transfer it to the stone. Spread the garlic cream sauce on the dough as the base. Layer the seared mushrooms on top, followed by ⅔ cup vegan parmesan and ½ tsp fresh thyme. Brush a bit of olive oil on the crust before baking, if desired. Bake the pizza at 425 for 20-25 minutes, until the crust turns golden brown. Check the pizza at 20 minutes to determine additional cook time. Let sit for 2-3 minutes before cutting and serving. *White whole-wheat flour may be substituted with bread flour, all-purpose flour, or regular whole-wheat flour. *Double the sauce recipe to use in pastas and wraps. *Dough recipe adapted from Bobby Flay'srecipe.